Mithila Mehta is most impressed by the dedication and passion of Frame The Star finalist Raju AK. As the second day of the Frame the Star finals drew to a close with a brilliant sunset over the misty hills of Naldehra, the entire lot of us caught up to exchange stories over dinner. The vibe was easygoing and relaxed, with a bulk of the hard work behind us. Kevin joined us, snug in his blue pyjamas as he drove us to riotous laughter with his accounts of the day. Altaf was holed up in his room, conceptualising his "greatest shot yet". And Raju, what was he up to? Unbelievably enough, he was still shooting! A Bangalore-based photographer, Raju has got to be one of the most dedicated and focussed people I have ever met. The manner in which he completely immersed himself in the contest with an endless determination to get his shots perfectly right was admirable. 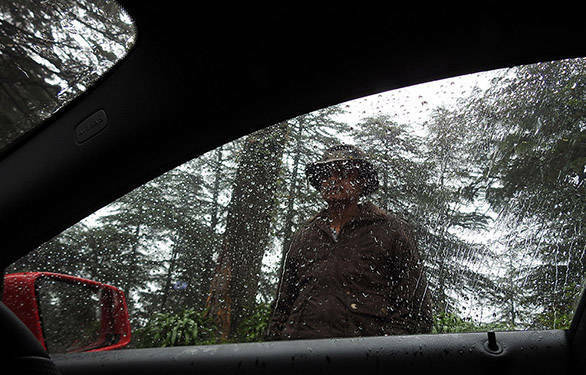 As we set out from The Chalets in Naldehra and made our way to Chandigarh, I joined Raju in his red Mercedes CLA 200. We took a beautiful route which led us through Kufri and Chail, before merging with the main highway further on. Our bright red car must have been quite a sight as we rolled past endless hills of green. The rain was pelting down relentlessly all through. During an earlier conversation, Raju had explained his modus operandi to me - he carefully conceptualised the situation and shot his head first and then worked to bring it alive by working backwards. A well thumbed notebook (which was carried everywhere) served as his bible. Watching Raju compose his shots was an absolute pleasure. Clad in his trademark round hat, he has climbed up steep hills, balancing his tripod and equipment. He has stood out in the rainstorm for hours, keeping his camera dry even as he was dripping wet. Raju even waded to the middle of a shallow river to capture a frame. We reached Chandigarh in the late evening, exhausted but exhilarated! That night, as all of us were sitting together at the Park Plaza in Zirakpur, talking about the trip that was, I witnessed something incredibly sweet. The competition was over (for all purposes) and Kevin and Raju engaged in a massive all-night bonding session  sharing work and technique with each other, without an ounce of secrecy. "You always learn something great from the photographers around," smiled Raju, before shifting his focus back to Kevin's work. All in a (hard) day's work, we say! Click here for more stories on Frame the Star 2015. Go grab a copy of this month's issue of OVERDRIVE for our 16-page story on the Frame the Star contest.